Leighann is a volunteer in the Bureau Drawer, where she helps out in the sorting room and assists in the shop. She’s been a wonderful addition to the shop since 2009 (nearly a decade!). You’ll recognize her by her distinctive laugh and her tiny Chihuahua, Chewy, who she brings to Interfaith once a month to have his nails trimmed by a fellow volunteer. 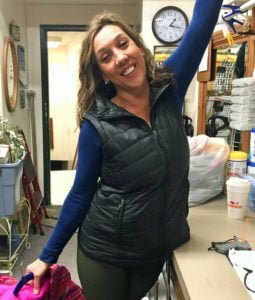 “Leighann has been volunteering in the shop two days a week for 10 years. She’s hardworking and dedicated to our fundraising mission. When she comes in the atmosphere totally changes. She’s friendly, busy and very outspoken. Customers, donors and volunteers love her so much and it’s noticed if she happens to be out on one of her days. They all ask where she is. Leighann always has animated stories to tell and she helps everyone have a great experience when they shop. She helps them find the perfect outfit or anything else they never knew they needed! She puts her magic touch in the shop whether it’s a special display, dressing a mannequin or cleaning and making the shop shine. It’s always something. 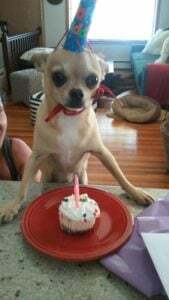 Chewy celebrates his birthday with a doggie cupcake. Why did you choose to volunteer at Interfaith? A former volunteer, Chickie, asked me to volunteer with her. I did and I got hooked from there. I think all the friendships I’ve made. It’s like a sisterhood to me. I just love what Interfaith stands for. What’s the most memorable item you’ve seen come through the Thrift Shop? There are several. I always remember that gorgeous plate we got. A crystal cake plate. We just loved it. And then it broke. I got the most beautiful Christmas tree (from the Shop) two years ago. It was a 9 1/2 foot Christmas tree somebody donated. I walked in the shop and it was sitting there and it wasn’t even half up. I already had a Christmas tree at home. But I just loved that tree. This was on a Tuesday. And then Friday I come in and the tree was still there. I said, “Oh the tree is still here. I have to get it. I have to get it.” So I bought it. It’s gorgeous, and now I put it in my kitchen. Also the unique people. There was a belly dancing girl. She’d belly dance in the shop in her bra and we’d all sit around and watch the show. Tell us something interesting about yourself that the other staff and volunteers may not know. I really wanted to be an airline stewardess. Back when they were popular with the little outfits and everything. I even went to school for it down in Miami. But it didn’t work out. I’ve also been married for 36 years. I’ve been with my husband since we were in junior high. He was my first boyfriend and I was his first girlfriend. I was a cheerleader and I used to cheer for him. He was a football player. He drove me home on his little Mongoose bike. We’re still together. Know someone who may be interested in volunteering? Have them reach out to volunteer coordinator Paula Daniels at 617-773-6203 ext. 28 or pdaniels@interfaithsocialservices.org.